The Houston Chronicle has the full story on this. A few days ago, a high-profile fundraiser was hosted by State Representative Sylvester Turner (D-Harris County), to celebrate a quarter-century of honorably serving in the State Legislature. Turner, of course, will be running for Mayor of Houston in 2015, all other things being equal. The Chronicle story insinuated that Turner officially announced his candidacy, though I have heard conflicting reports. Anyways, this has created quite the buzz at City Hall. Turner, as I have opined in the past, is the undisputed frontrunner in the 2015 Mayoral election. The election will be sure to feature many names, as incumbent Mayor Annise Parker is term-limited. Thus, Parker’s appearance at Turner’s fundraiser raised some questions. Will Parker be supporting Turner? It would obviously be a difficult decision, since some of the other possible candidates include City Councilmember Stephen Costello (R-At Large 1), the Chair of the Budget Committee, and City Councilmember Ed Gonzalez (D-District H), the Mayor Pro Tem, both of which are very close to her. Yes, she is, but not for long. Like it or not, Parker is a lame duck. Quack, quack, quack! First of all, what else does she have to do? She worked honorably to pass consensus-based overhauls of laws on wage theft and payday lending in the past year. Earlier, she has put her impression on density, transportation and historical preservation, to name a few more. More recently, also ran roughshod over the process to divisively pass a non-discrimination ordinance (which I supported) and an overhaul of vehicle-for-hire regulations (which I didn’t support), respectively. But now, there isn’t much left to do, beside solve some of our big budget problems. Ostensibly, Parker has one more opportunity to convince the Legislature to amend pertinent laws on negotiations with the Firefighter Union, but I am definitely not holding my breath. Beyond that, Parker’s antics over the long summer didn’t make her any friends. She has probably used up a fair share of her political capital and, with her days in office quickly running out, it is unlikely to be replenished any time soon. Nobody likes sour grapes, particularly in the form of refusing to recognize one’s own political mortality. Bill White, the Mayor of Houston from 2004 to 2010, was unusually graceful in his exit, but this may have had something to do with the fact that he was in the midst of a race for the Governor’s mansion at the tail end of his term. I know that Parker is interested in running for Comptroller in 2018, but that is a little ways after she must vacate the third floor of City Hall. Perhaps this is old news by now, but on Friday the Houston Chronicle reported that Attorney General Greg Abbott, the Republican candidate for Governor, would be pulling out of one of two scheduled debates for the gubernatorial election, and the only televised one. Immediately, he was castigated by the usual suspects, prime among them State Senator Wendy Davis (D-Tarrant County), the Democratic candidate for Governor. He also received some derision from Libertarians as well. The debate was scheduled for September 30th at WFAA, the ABC affiliate in Dallas. However, after criticism from around the State, Abbott reversed course. 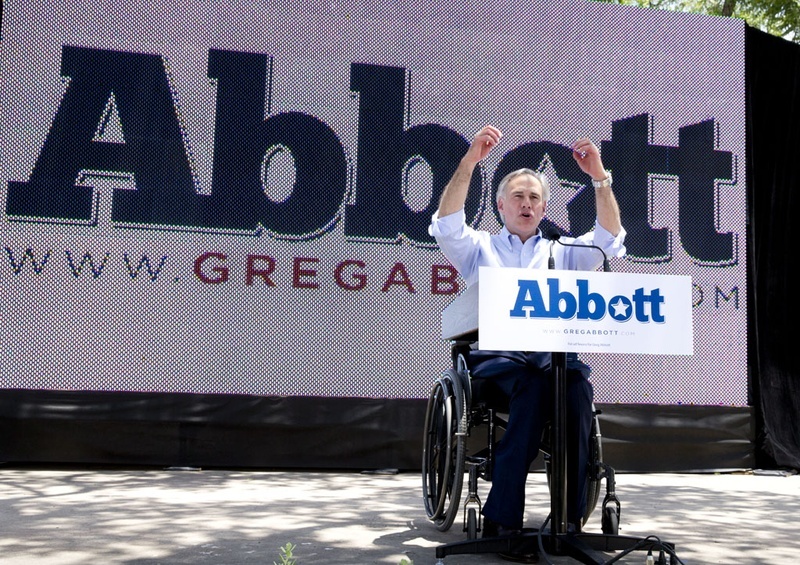 In a somewhat cringeworthy about-face, Abbott announced he had accepted a nearly identical offer to participate in a televised debate on the same date at KERA, the NBC PBS affiliate in Dallas. A separate debate, schedule for September 19th in Edinburg, has always remained on the table. Ostensibly, the excuse given by the Abbott campaign was that he had some anonymous concern with formatting. A weak excuse, by any stretch. Rightly so, as I just mentioned, he was bombarded by criticism from both the left and the right (granted, with more cacophonous critiques coming from the former). The 2010 gubernatorial campaign between Rick Perry and Bill White was arguably best defined by Perry setting the terms of the entire process. Perry came up with some exceedingly lame excuse to not debate White (and now, of course, the entire country knows why), and the entire State’s political intelligentsia (not to mention its at times obsequious-to-Perry press corps) did not bat an eye. Granted, there is something worse about chickening out after making a commitment, but at its core, Abbott committed the very same transgression. Except –and rightly so– he was almost universally chastised for this action. The Morning News article then goes out of its way for a long discussion on the background of the issue. They discuss how immense pressure was first put on Abbott’s office to investigate by a Tea Party group called the “King Street Patriots.” They have, sadly to say, historically been a hothead of racial animus, and this controversy has proved to be no exception. The article notes reports from the KSP meetings that attempted to improperly tie Houston Votes with both ACORN and the New Black Panther Party, despite absolutely no evidence that any of the three were interconnected. Specifically in Houston, right-wing bashing of the New Black Panther Party is typically used as a catch-all dog whistle for blatant racism. The full account provides some really fantastic background, and I cannot recommend enough reading the entire article; at this point, it’s all free online. But, in my opinion, this tidbit is particularly more troubling than the debate reversal. The connotation revealed is not necessarily anything that the well-read political class did not already know, but it is a good thing that the media can state once more unequivocally that Abbott is wholly beholden to Tea Party interests, many of whom are not –shall we say– “kosher” in their intentions. At its core, in my humble opinion, groups such as the KSP are uncomfortable with Black people voting and becoming part of the civic process. This is the same group that sent “poll watchers” to minority neighborhoods, ostensibly in an effort to maintain the “integrity of the process,” but realistically as a way to intimidate prospective participants using Klan-era tactics. The two options here are that either Abbott knowingly spearheaded this cluster of epic proportions (and then lied about it), or that he was asleep at the wheel. In both instances, be it negligence or malice, grave doubts should be installed in any voter of this man’s capability to be a lawful and effective Governor. Pardon me, but I hope you can help me in search of someone. She was last seen wearing a dress with pink tennis shoes, has blonde hair and is about yea high. My Democratic gubernatorial nominee is missing in action. Her name is Wendy Davis, and hopefully you can help me find her. Now, for better or for worse, I follow Statewide politics to the point of obsession, so I literally do know that she has been popping up at events in towns from Austin to Fort Worth, but most people are not like me. Most people know of Wendy Davis because of the abortion filibuster, when she stood up for 13 hours against a bill that was ultimately responsible for closing most of the abortion clinics in the State. A few less, but still a sizable percentage, know that she is the Democratic nominee for Governor. Beyond that, who knows. I can’t say that I have ever seen a Wendy Davis for Governor commercial, I don’t think I’ve ever gotten a direct mail piece from her and I surely do not pass any billboards on my morning commute that advertise for her campaign. Last time I checked, Davis has a great deal of money in the bank, and her obsequious supporters have pointed to this as a sign that she will run a serious campaign. Unfortunately, having a lot of zeroes in a bank account does not command respect or momentum in and of itself. The only reason that money is feared is because it is typically spent. I’m not exactly sure what is happening in this situation. Click here to read the full opinion piece!